The silver thread is hand-crafted and has a wavy curve at the fingertips. 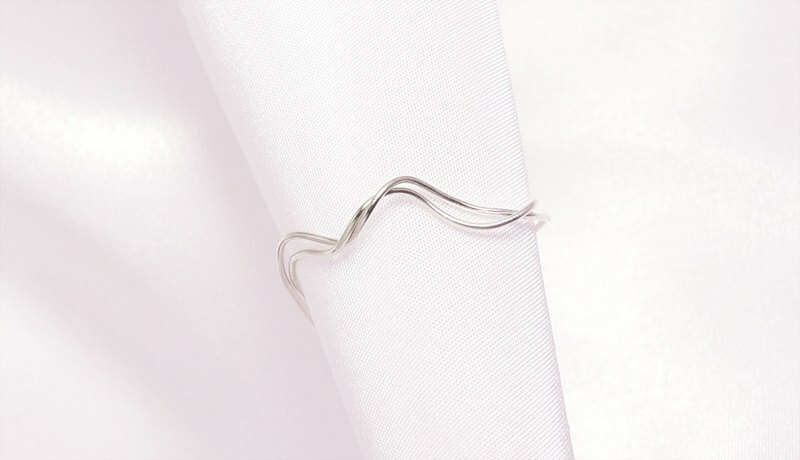 https://c2.staticflickr.com/2/1779/42253938750_c6afc5e100_o.jpg [Material] 925 sterling silver 【specification】 Width: about 14~23 (mm) according to the size of the ring Height: about 5~10 (mm) according to the size of the ring Thickness: 1 (mm) Ring circumference: can be customized 4~20 (International Ring) 【package】 ✽ Each comes with a “portable carton, zipper bag, security card, silver cloth (the color will be shipped randomly, Don't pick up the color)" one each. ✽ In order to love the earth with you, we have abandoned the hard carton packaging and the foam lined. Use a portable paper box. https://c2.staticflickr.com/6/5589/30826693833_fe19dfebc9_o.jpg [叮咛二三事] 每次 After each wear, gently wipe it with a silver cloth and store in a sealed bag to keep it dry. avoid collision. ✽ The silver cloth contains maintenance ingredients. Do not wash with water. It can be reused until the whole piece is blackened and discarded. 请勿 Do not over-rotate the adjustable ring to avoid breakage. ✽ Silverware, please avoid contact with cosmetics, perfume, rain, sea water, bleach, chemical liquid, grease And other substances. 请勿 Do not wear silver ornaments for the following activities or places: bathing, swimming, hot spring areas, beach water, Exercise, familywork, violent collision, and engaging in chemical experiments. ✽ Product photos may have chromatic aberration due to factors such as light or computer screen. Please pay attention before ordering. [about service] ✽ Warranty period: One year warranty period from the date of purchase, the warranty card must be returned together during maintenance. So please be sure to keep it safe. ✽ Warranty content: Free for you to clean and maintain, repair new products. 正常 During the warranty period, the normal consumption of the goods, human error or force majeure causes damage, because Maintenance costs are still required in the warranty. 来回 The return shipping cost of the repaired goods needs to be paid by yourself. Please forgive me.